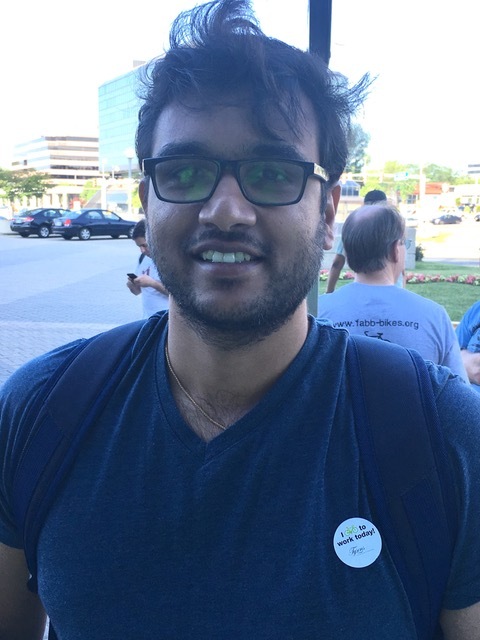 Herndon resident Krishtam Chin stopped by the Tysons pit stop on Bike to Work Day and helpfully answered FABB’s brief survey questions. FABB: Why do you ride? Krishtam: I ride for the exercise and the sheer pleasure of being on my bike. I’ve just started this year trying to commute to work at least one day each week. FABB: That's great! Where do you ride? Krishtam: I mostly ride on the Washington and Old Dominion Trail. For commuting, I ride from Herndon on the W&OD and then use bike lanes and side streets to get to my job in Tysons. FABB: What do you most like about riding? Krishtam: I love the fresh air. FABB: What would you like to change to make it easier and safer for you to ride? Krishtam: I would like to see more bike lanes and more connected networks of bike lanes. Businesses in Tysons, such as Tysons Corner Center, are devoting more attention to making the area a more bike-friendly destination for employees and customers. FABB is working with the Tysons Regional Chamber of Commerce and the Tysons Partnership to help insure that the needs of cyclists (and the benefits of serving the bicycling community) are taken into consideration as Tysons continues its quest to become America’s next great city. FABB applauds initiatives, such as Access Tysons, that seek to improve multimodal transportation options to reduce congestion in the area.